How to work Elsa from Frozen into your daily wardrobe. I was wondering when the cosplay video was going to show. Overall, I liked it and I can't wait to see more of it! Ooo this is a good idea for a show. I like this. More please! I actually have no idea what I'm doing, and I'm definitely not qualified to be giving makeup tutorials. Why do it then? I'd imagine that line was there for humor, but it honestly seems pretty unprofessional to be showing how to do something and then say "I have no idea what I'm doing, I'm not qualified for this" as you're doing it, considering the show is featured content on a website. Otherwise, not a bad episode. Huh. Well, that was... Different. Not sure what to say really. Interesting concept. Definitely a show I'll be following. Eesh, no kidding. It wasn't that bad until they got to the skirt and petticoat. Either way, it's a nice outfit and a nifty series concept. Good work everyone. How can I get a little Borderlands-style colorful cel shading into a man's everyday wardrobe? 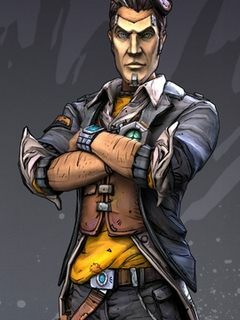 I feel like channeling a little Handsome Jack on some days could get help me grenade jump up the corporate ladder.